Dexanabinol (HU-211 or ETS2101) is a synthetic cannabinoid derivative in development by e-Therapeutics plc. 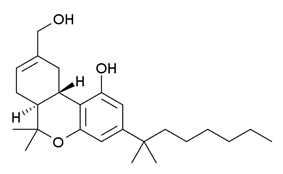 It is the "unnatural" enantiomer of the potent cannabinoid agonist HU-210. Unlike other cannabinoid derivatives, HU-211 does not act as a cannabinoid receptor agonist, but instead has NMDA antagonist effects. It therefore does not produce cannabis-like effects, but is anticonvulsant and neuroprotective, and is widely used in scientific research as well as currently being studied for applications such as treating head injury, stroke, or cancer. It was shown to be safe in clinical trials and is currently undergoing Phase I trials for the treatment of brain cancer and advanced solid tumors. HU-211 is not scheduled at the federal level in the United States. "HU-211 ((6aS,10aS)-9-(Hydroxymethyl)-6,6-dimethyl-3-(2-methyloctan-2-yl)-6a,7,10,10a-tetrahydrobenzo[c]chromen-1-ol)" is a Schedule I controlled substance in the state of Florida making it illegal to buy, sell, or possess in Florida. ^ University of California, San Diego "Synthetic Cannabinoid May Be Used as Brain Cancer Treatment". (28 September 2012) Laboratory Equipment. Retrieved 28 September 2012.